The All India Muslim Personal Law Board (AIMPLB) is a non-government organisation constituted in 1973 to adopt suitable strategies for the protection and continued applicability of Muslim Personal Law in India, most importantly, the Muslim Personal Law (Shariat) Application Act of 1937, providing for the application of the Islamic Law Code of Shariat to Muslims in India in personal affairs. Some Muslims followed the common customary Hindu civil code smoothly till 1937. The Board presents itself as the leading body of Muslim opinion in India, a role for which it has been criticized as well as supported All India Muslim Personal Law Board was set up during Prime Minister Indira Gandhi's time. 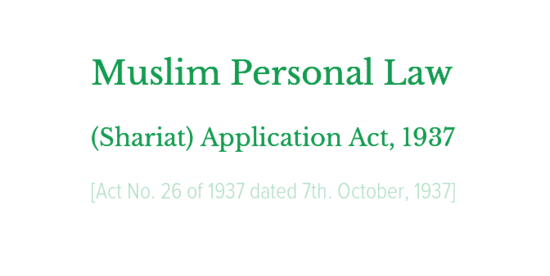 (1) This Act may be called the Muslim Personal Law (Shariat) Application Act, 1937. Notwithstanding any custom or usage to the contrary, in all questions (save questions relating to agricultural land) regarding intestate succession, special property of females, including personal property inherited or obtained under contract or gift or any other provision of Personal Law, marriage, dissolution of marriage, including talaq, ila, zihar, lian, khula and mubaraat, maintenance, dower guardianship, gifts, trusts and trust properties, and wakfs (other than charities and charitable institutions and charitable and religious endowments) the rule of decision in cases where the parties are Muslims shall be the Muslim Personal law (Shariat). may by declaration in the prescribed form and filed before the prescribed authority declare that he desires to obtain the benefit of 7[the provisions of this section], and thereafter the provisions of section 2 shall apply to the declarant and all his minor children and their descendants as if in addition to the matters enumerated therein adoption, wills and legacies were also specified. (2) Where the prescribed authority refuses to accept a declaration under sub-section (1), the person desiring to make the same may appeal to such officer as the 8[State] Government may, if he is satisfied that the appellant is entitled to make the declaration, order the prescribed authority to accept the same. (1) The State Government may make rules to carry into effect the purposes of this Act. (3) Rules made under the provisions of this section shall be published in the Official Gazette and shall thereupon have effect as if enacted in this Act. (7) Section 4 of the Ajmer Laws Regulation, 1877. 1. This Act has been amended in Madras by Madras Act 18 of 1949. 2. The words "in the Provinces of India" omitted by the A.O. 1950. 3. Substituted by the A.O. 1950, for the words "all the Provinces of India". 4. Substituted by the Miscellaneous Personal Laws, (Extension) Act, 1959, w.e.f. 1st. February, 1960. 5. The words "excluding the North-West Frontier Province" omitted by the Indian Independence (Adaptation of Central Acts and Ordinances) Order, 1948. Provided that nothing contained in this Act shall apply to the Renoncants of the Union territory of Pondicherry. "-(Vide Act 26 of 1968). 6. Substituted by the Adaptation of Laws (No.3) Order, 1956, for the words "a Part A State or a Part C State". 7. Substituted by the Muslim Personal Law (Shariat) Application (Amendment) Act, 1943 (16 of 1943), for the words "this Act". 8. Substituted by the Adaptation of Laws Order 1950, for the words "Provincial". 9. Substituted by the Muslim Personal Law (Shariat) Application (Amendment) Act, 1943, for the words "Provisions". 10. The brackets, figures and words "(3) Section 37 of the Bengal, Agra and Assam Civil Courts Act, 1887" omitted by the Muslim Personal Law (Shariat) Application (Amendment) Act, 1943. This omission has the effect of reviving the operation of section 37 of that Act.